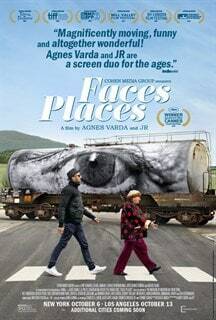 The Big Picture | Faces Places (Review) | | Quiet Lunch. Faces Places is the little documentary that could. Nominated for an Academy Award for Best Documentary Feature, the filmmakers transform the quotidian into objects of fascination. There’s an inherent narcissism about making a film about the process of making art yet the subjects are so lacking in ego yet charming that it’s a delight to watch. 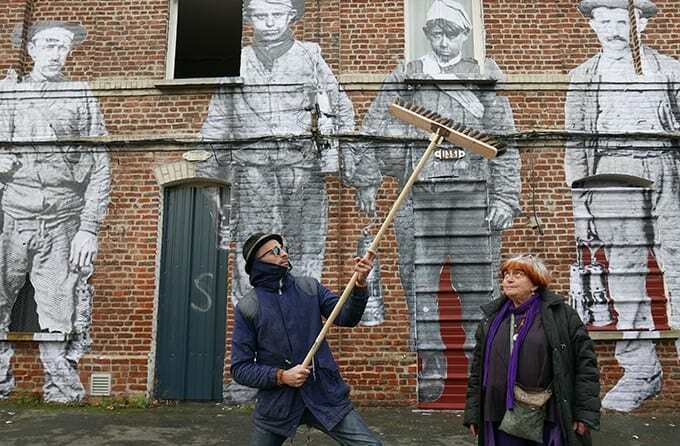 JR and Agnès Varda explore the French countryside in his van that is decorated like a gigantic camera. Inside is a telephone-booth-size studio and large format prints extrude out the side. But really, the film is full of gems of great life advice or at least things to think about. I found myself going back to Varda saying she likes her feet planted firmly on the ground though she thinks her feet are too small. She wants to take pictures so faces don’t fall through holes in her memory. JR is 33 and estimates that Varda has seen 88 springtimes; JR gives as good as reason as any to share an ambitious project together. The film opens with animated titles imagining how the two artists in crime meet. They go through a series of hilarious scenarios like a disco and bumping into each other randomly on a country road. “Chance has always been my best assistant,” Agnès Varda tells JR. What seems clear is that Varda befriended the young art celebrity in the last few years. 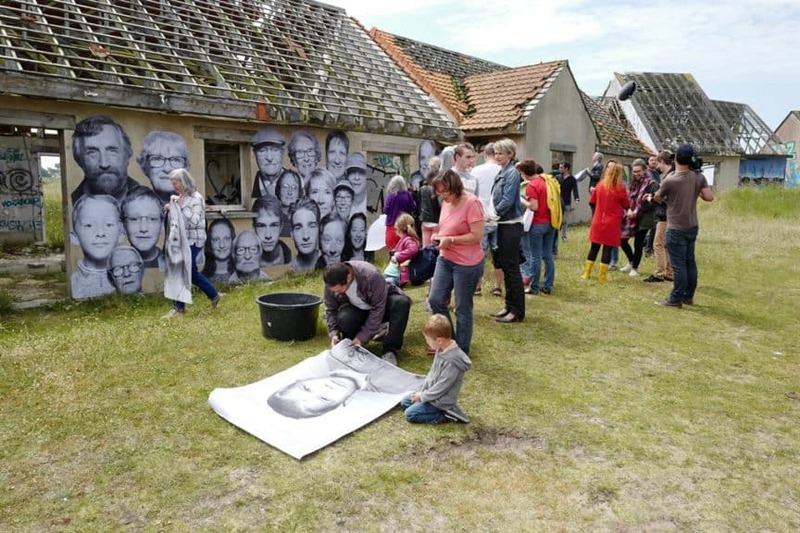 Their plan is to drive from one rustic European village to another, invite the townspeople to pose in the tricked-out van that JR has transformed into a mobile studio and paste the resulting immense five-second prints onto any vertical surface in their village where they will enhance the landscape and tell a story. “We’re aiming for the power of imagination,” said Varda. There’s almost a heartbreaking scene in the film where they paste an enormous print on a washed-up piece of wreckage on a beach in Normandy and it is completely erased by the wind, sea, and salt within hours. It represents loss and beauty for multiple reasons, it was a person from Varda’s youth, since dead, resurrected by a giant print and once again part of the elements of air, earth, and sea. The scene stuck with me for the months following the New York Film Festival when I saw Faces Places. 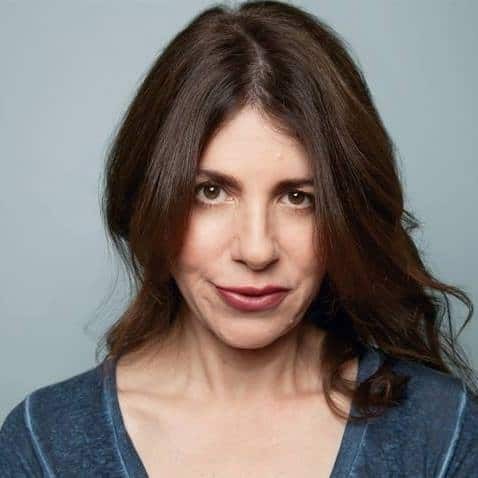 There were several documentaries that hadn’t been picked up by a distributor until the festival including Sara Driver’s film about the pre-fame years of Jean-Michel Basquiat: Boom for Real which is slated for theatrical release by Magnolia Pictures this May. 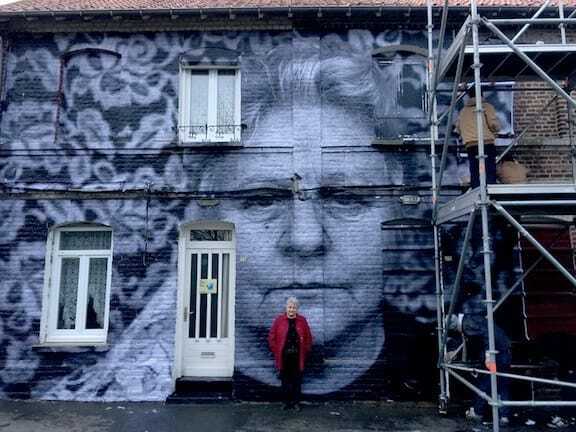 Like Faces Places, Boom for Real is about the ephemeral both of youth and of street art. There aren’t any spoilers, we know how it ends. JP: Al, do you think about the natural elements when you do an installation? AD: It isn’t so much being attracted to surfaces, objects, and locations that might either move, be covered up or affected by the elements as much as it is about my work being in plain public sight. JP: When you do an installation, you are always risking the ephemeral. How has that changed for you throughout your career? AD: The “ephemeral” factor in “STREET ART” is a secondary element for me. Something I have had to come to accept and work with. I probably give more consideration to the un-natural elements in planning the more AMBITIOUS installations such as HOW LONG WILL IT BE BEFORE SOMEONE TEARS IT DOWN. JP: JR is really at the beginning of his career and Varda is at the end of her 88 Spring times. You are betwixt and between JR and Varda in terms of age. You’ve had a steady career as an artist– in NYC. Have you always been interested in that which can be covered over, removed, washed away, ripped off a wall or destroyed? Can you talk a bit about that?